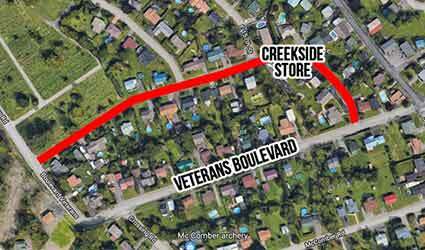 The Capital Unit of the Mohawk Council of Kahnawà:ke would like to inform the Community that installation of asphalt in the Creekside Store road area will continue today (Tuesday, October 9) until 5pm, weather permitting. The work includes applying the final layer of asphalt in the shaded area indicated on the map below. There will be limited access to residence driveways. Proper signalization will be planned to delimit the work zone. Access to homes in the work area will be limited during the paving operation. The work is expected to be completed today.